Posted January 16, 2018 · Post your latest print! Sorry for the sickness! But this one came out absolutely disgusting. The sickest thing I've made I think. Shame I didn't finish the hair :(. Nice concrete coffee maker by the way!! I love the cup! Posted January 17, 2018 · Post your latest print! Love it. 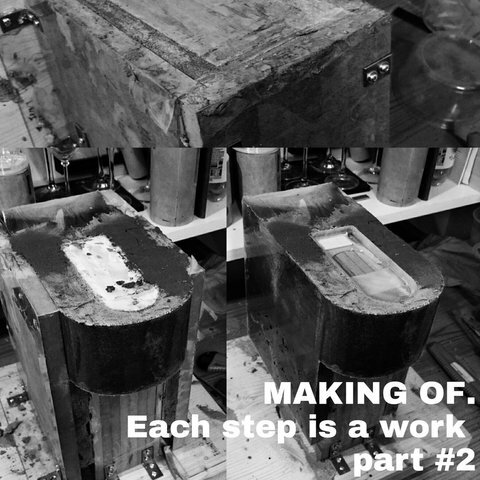 Any tips to share on concrete molds and the production process? I'm attaching few pics. You will find some answers to your question. 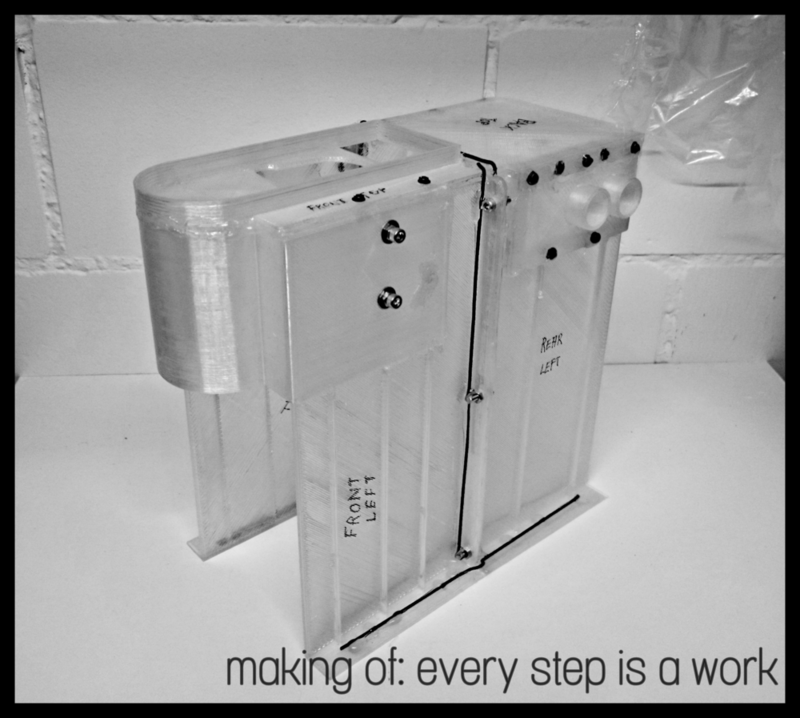 - I created a internal shell ( few parts that have been glue, screwed). This shell replaces the initial aesthetic cover of the machine. 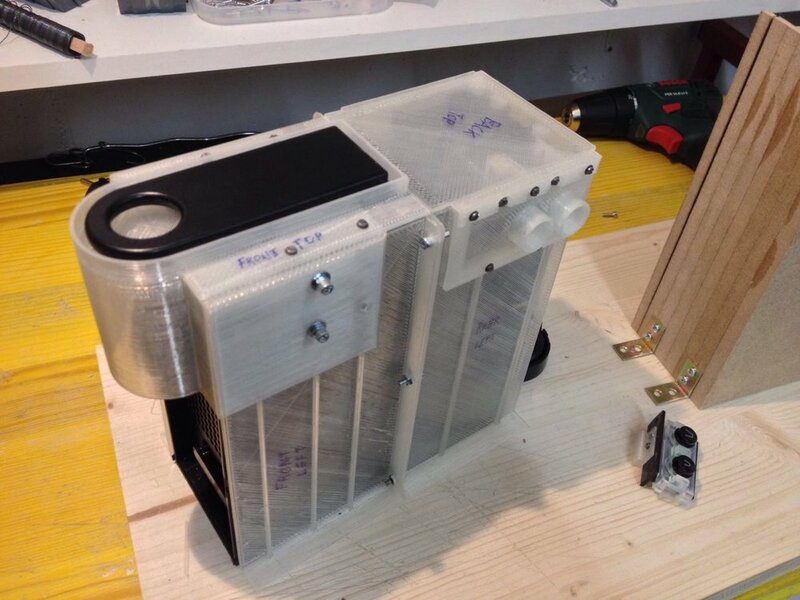 - I have slightly reworked the chassis of the machine, mainly to accommodate the button on the side. - assembled the mold, mainly using MDF wood (straight). 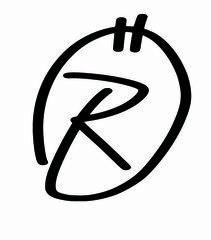 The frontal face has been printed to give the rounded shape. 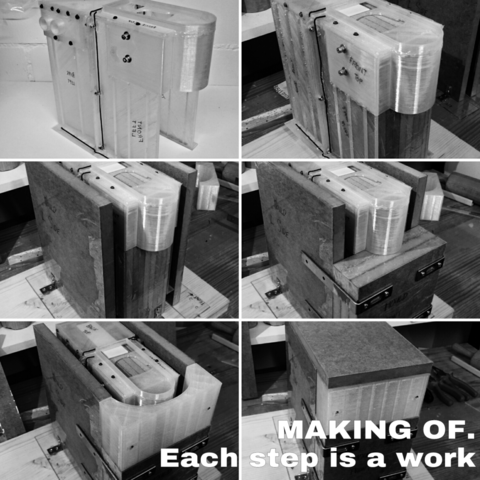 Tape has been used to coat the various MDF and mold parts to ease the unmolding phase. PS: I do have a long list of improvement point that would be needed to implement to make improved samples. Fact is that, I LOVE creating one sample ( let's call it prototype), the first one. Then, "replicating" it is not that much my main driver. I would love to share my work so that other can "steal like an artist" ( great book by the way) and make their own. Ill post more info soon. Posted January 19, 2018 · Post your latest print! I can imagine this would fit very well in a modern minimalistic interior. It is an eye-catcher. I guess sooner or later someone is going to pick up this idea and commercialise it. So you might as well try and sell it first to the Expresso (or other) manufacturers. In fact, I have kind of sold it. Not the product itself, but I have sold....the creative process behind it. my initial objective was to sell 200h at 20chf. At the end of the day, it went far beyond my expectation. I realised how people can be generous, particularly when they are reassured how their donation will be used. Total $$ that I collected was donated for a giveback initiative. "project name was: "makeitbold". 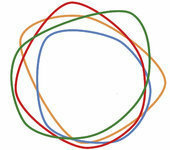 Project scope: "turn an every day act into a chance to save a life." Posted January 20, 2018 · Post your latest print! Whats 200h and 20chf? I have no idea just letters to me? In other words his hourly rate is about the same rate as slaves get (nothing). Or maybe 200h means something else. Ahh well I just get satisfaction (sometimes), some money would be nice from time to time though! lol. 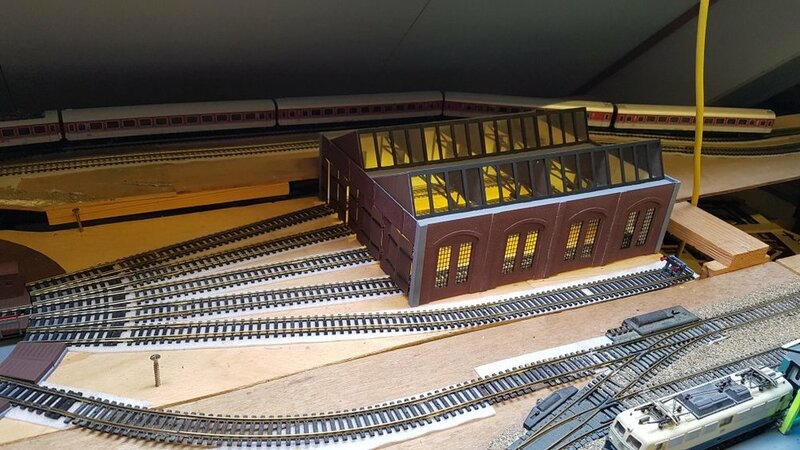 Finally I have been able to finish my locomotive shed. All files are available on youmagine. cheers guys, I 'm quite new to the forum, but I'm amazed by the great stuff I could see so far. I 'll share some other stuff. I'm all out of bubble gum! Posted January 21, 2018 · Post your latest print! Posted January 23, 2018 · Post your latest print! That was such an excellent movie! I didn't knew the original title until now (I'm French) but the face immediately made me think of the movie, so I'd say it does the job perfectly! Posted January 28, 2018 · Post your latest print! My family has a lot of Football fans. American football that is. Especially college football, and even more so if someone is an alumni. So, I made my dad and two uncles football ornament mascots. Yes, I am still catching up. That is why I got two printers: One fer bidness (When I gots it) and one fer personal. 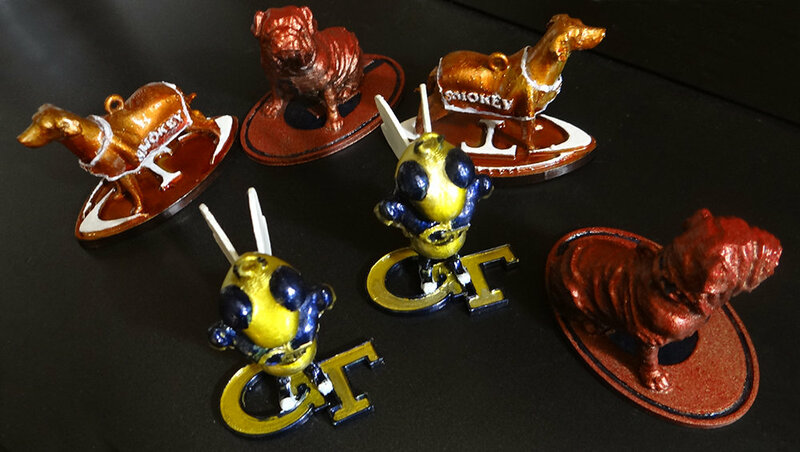 These would be the University of Georgia Bulldog, Georgia Tech Buzz (Yellow jackets) and University of Tennessee Smokey. Painted with metallic paints and fingernail polish. Had to do a lot of wet on wet spraying on those first few layers. Just curious, as I've been doing a lot of dogs lately, but how did you print them, with soluble supports or breakaway or regular pla support, none, or in parts? I try to avoid support and infill at all costs to shave time off my prints as I'm so impatient. Im doing a long HR Giger style 36hr print at the moment with stupidly sparse supports, I hope it does not collapse!! I can't print it flat because id have to use infill due to all the cavities! bummer! I use the PVA supports. U am spoiled with the dual extrusion. Posted January 30, 2018 · Post your latest print! 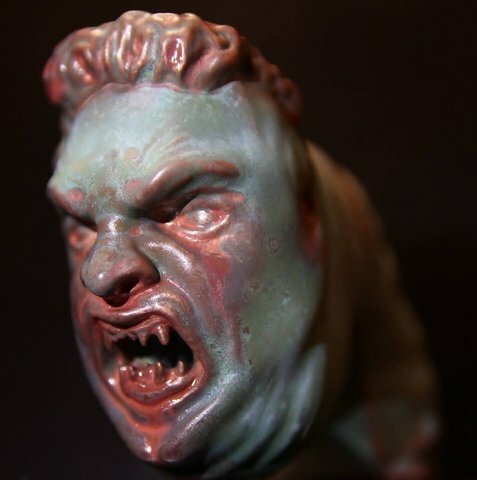 My latest sculpt and print. A few errors due to hollow print and no infill but generally came out ok! Will show it after plating it! Should look lovely. I am impressed with your sculpting skills. The printing is nice, but you sculpting skills put you in another level. Posted January 30, 2018 (edited) · Post your latest print! Whoww! Well done! Question though concerning your creative process. Are you scanning a initial object, refining with modeling cad ( ie meshmixer) or do you modelise in 3D from scratch? Or else? Just curious. On my side, I model all my creation with rhino. But my parts are not that complicated and detailed as yours. In next future, I would like to test this technique of 3d scanning, then rework, then print.let's see. 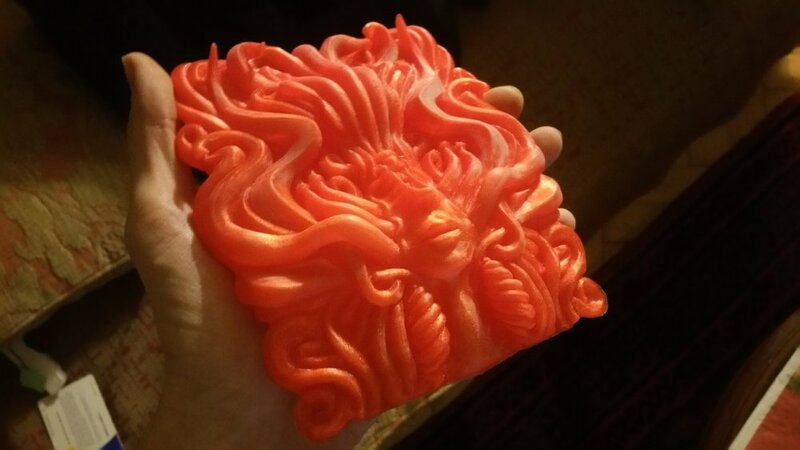 In next future, I would like to test this technique of 3d scanning, then rework, then print.let's see. Unless you are going to retopologize the scan, you will be dealing with a gazillion triangles. That is a lot to move with any sort of grace of curve or speed. 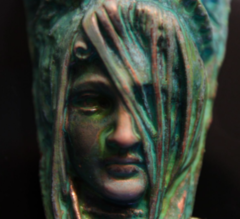 @Bollicine I used to scan my friends faces at the start of my sculpting learning because I was not experienced enough to realistically model their faces and memento/catch123/remap used to be free (not anymore) but it now takes me the same amount of time to just sculpt it. May not be as accurate but its a never ending learning game. I model everything from scratch now, more fun and more control over everything. I always loved drawing though so 3d sculpting just gives me another dimension to play with. Also because I had a 3d printer I got sick of crap free models on the internet so I figured if I learned to sculpt then I could make 'Anything'. Lol It was just the initial lie of no layer lines that I had to overcome at the start, as I thought ABS and acetone vapour was the way to go. I learned that it was not after my first attempt and just saw way too much quality loss. Luckily my experiments with PLA turned out much better! !